Zoooooooming across Europe ~ Live Video! Marina Marina made another little movie of me, this time singing “Little Grey Sparrow” at our house concert in Basel Switzerland on the 16th; intercut are with more sights from our European tour so far. Enjoy! The Ladies in Waiting and aBabe Music Present Jingle Ma Belle – A Holiday Compilation! Hope you can join us for the album launch performance at Hugh’s Room (Toronto Canada) on Thursday December 18th! 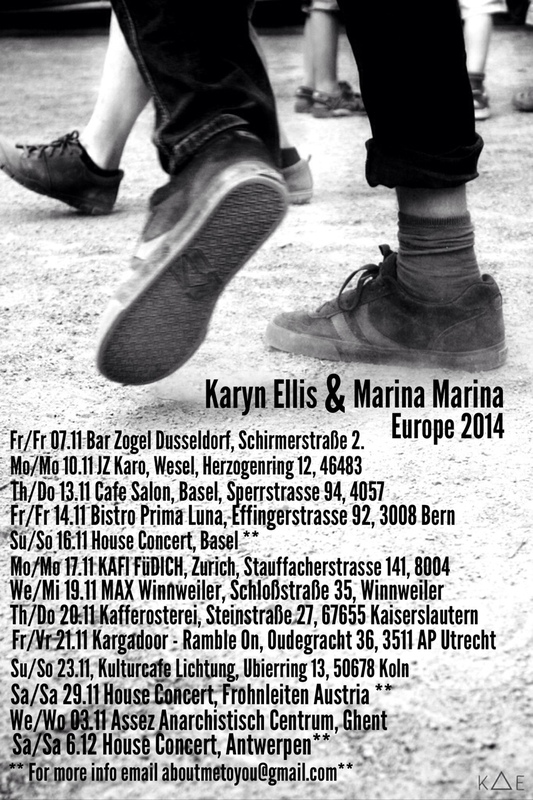 Here’s a little movie that Marina Marina made of me singing “Bitter Grasses” at Bar Zogel in Dusseldorf on the 7th. And a fine bike ride!